Applications dans le domaine de la recherche pharmaceutique et chimique. 1) T. Detoisien, M. Forite, P. Taulelle, J.L. 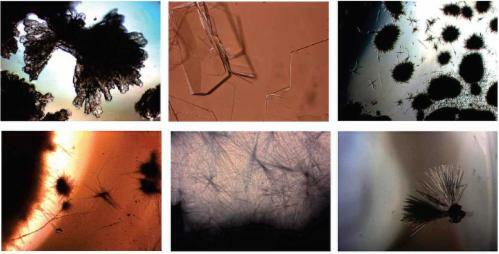 Teston, D. Colson, J.P. Klein, and S. Veesler, A Rapid Method for Screening Crystallization Conditions and Phases of an Active Pharmaceutical Ingredient. Organic Process Research & Development, 13. (2009) 1338-1342. 2) Astier J. P. and Veesler S., Using temperature to crystallize proteins: a mini-review. Cryst. Growth Des., 8. (2008) 4215-4219. 3) S. Veesler, N. Ferté, M.S. Costes, M. Czjzek, and J.P. Astier, Temperature and pH effect on the polymorphism of Aprotinin (BPTI) in sodium bromide solutions. Crystal Growth & Design, 4. (2004) 1137-1141. 4) Lafferrere L., Hoff C., and Veesler S., In situ monitoring of the impact of liquid-liquid phase separation on drug crystallization by seeding. Crystal Growth & Design, 4. (2004) 1175-1180. 5) S. Veesler, L. Lafferrere, E. Garcia, and C. Hoff, Phase transitions in supersaturated drug solution. Organic Process Research and development, 7. (2003) 983-989.